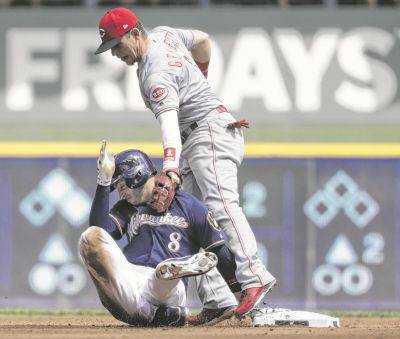 Cincinnati’s Scooter Gennett catches the Brewers’ Ryan Braun off of second base to tag him out during Wednesday’s game in Milwaukee. Peralta tossed seven scoreless innings and drove in a run with his first career hit, combining with two relievers on a five-hitter in the Milwaukee Brewers’ 4-0 victory over the Cincinnati Reds on Wednesday. Peralta was 0 for 22 with 11 strikeouts this season before he drove in the Brewers’ second run with a fourth-inning single. He advanced the runners with his first career sacrifice bunt when the Brewers added two runs in the sixth. The Brewers made it 4-0 in the sixth when Jonathan Schoop and Pina singled and advanced on Peralta’s bunt. Yelich and Lorenzo Cain followed with consecutive RBI singles. Sloppy baserunning cost Milwaukee a couple of early runs. Braun doubled with one out in the second, but was caught off the bag on Schoop’s fielder’s-choice grounder to shortstop. Pina then followed with a single. RHP Matt Albers (left hamstring) was reinstated from the 10-day disabled list and OF Keon Broxton was optioned to Class-A Wisconsin. Albers is 3-3 with a 6.23 ERA in 29 relief appearances with the Brewers. Broxton’s move was procedural, allowing him to remain in Milwaukee while his paternity leave is pending. Reds: Right-hander Anthony DeSclafani (6-3, 4.12 ERA) starts the opener of four-game series today against the Cubs. He is 2-0 with a 0.83 ERA in three starts in August, allowing one run in his last 19 2/3 innings.